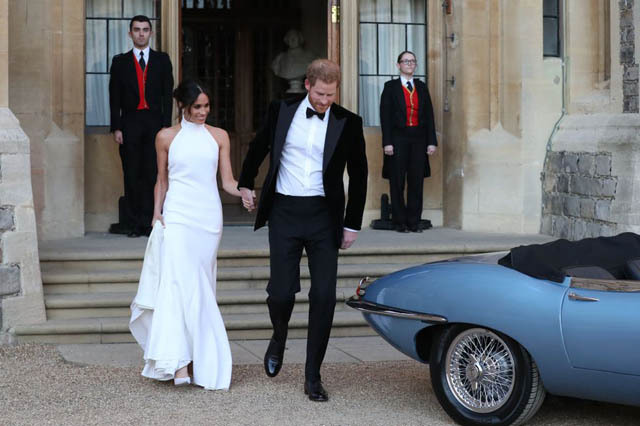 The bride changed into a glamorous Stella McCartney gown for the evening reception. 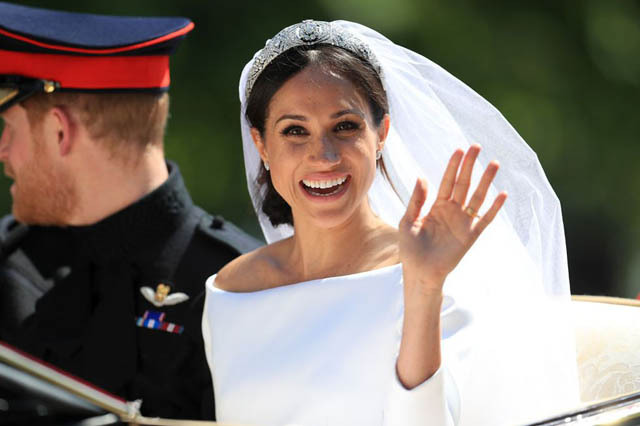 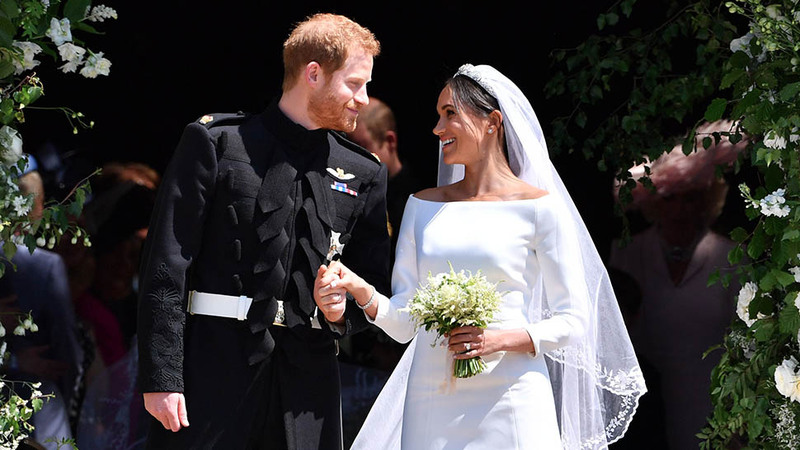 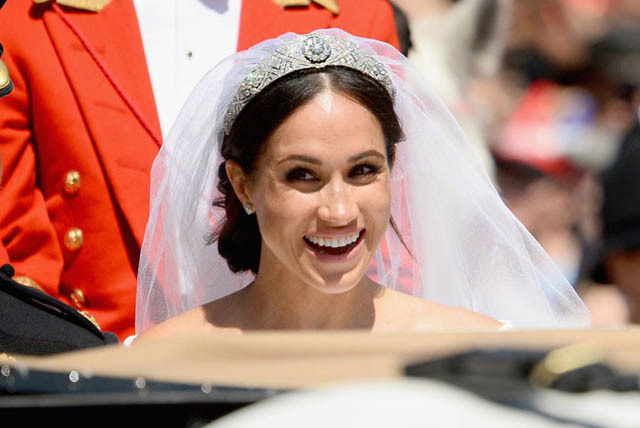 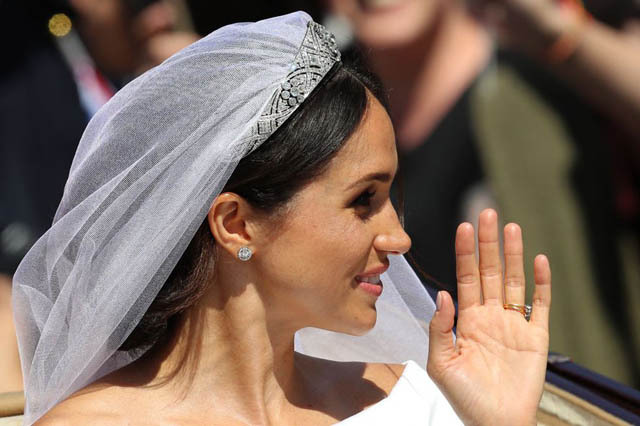 From the guests arriving at Windsor Castle to your first look at the bride's stunning gown, follow along for all the photos from the royal wedding, starting with crowds cheering about the big day. 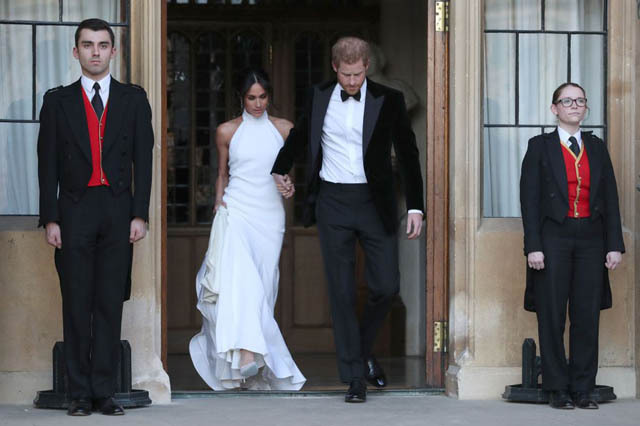 Prince Harry and Meghan Markle head to their evening reception. 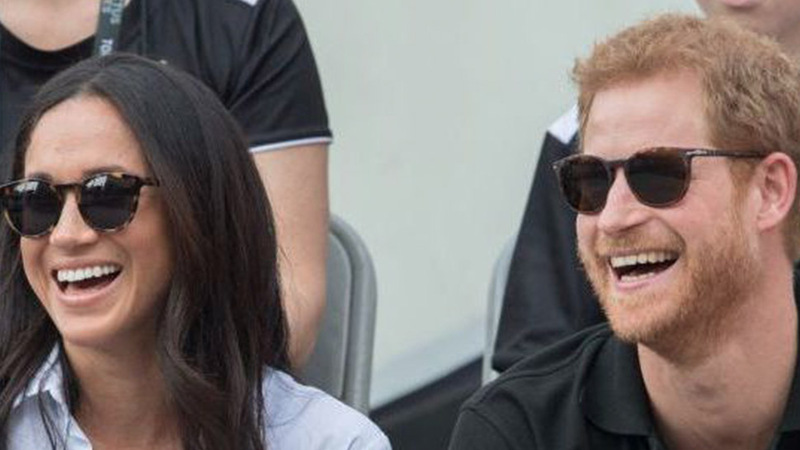 Meghan Markle and Prince Harry look like they're ready to celebrate. 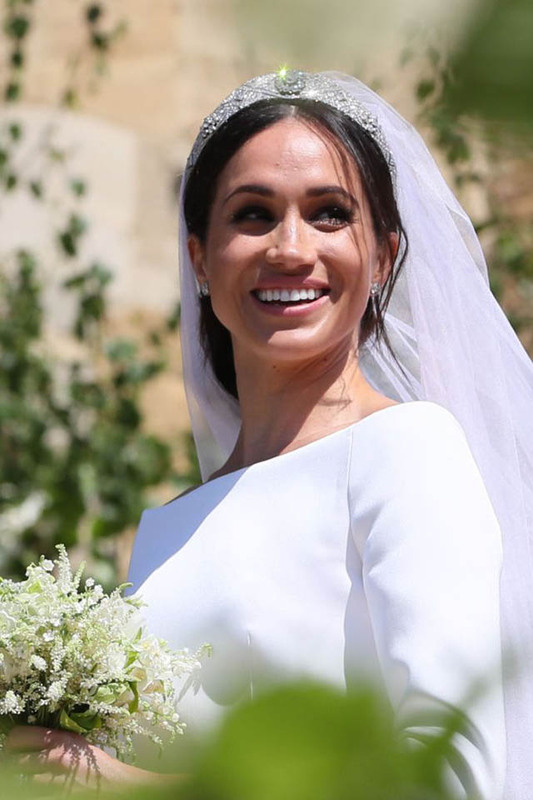 Meghan Markle wore a second gown by Stella McCartney. 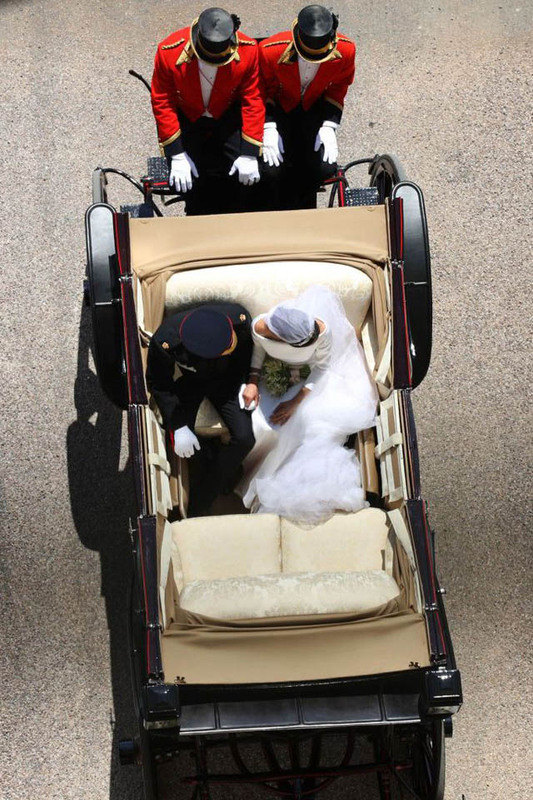 The bride and groom hold each other's hands during their carriage ride. 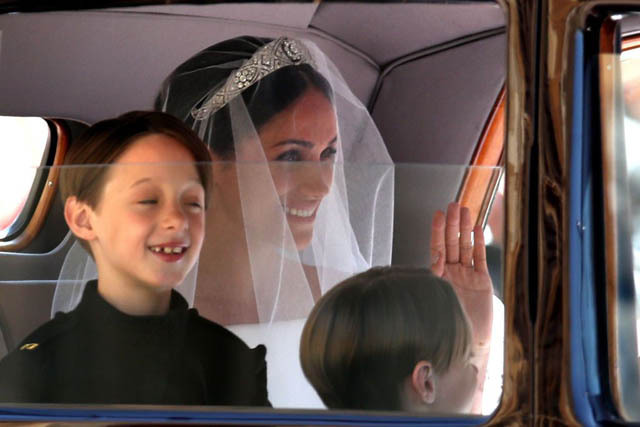 Meghan looks like she's having the time of her life. 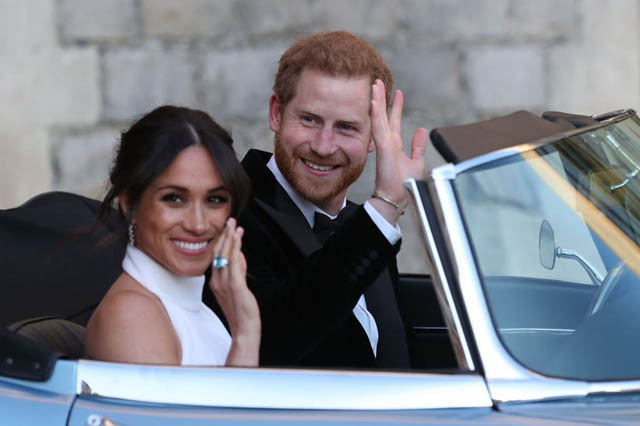 The newlyweds set off for a carriage ride through Windsor. 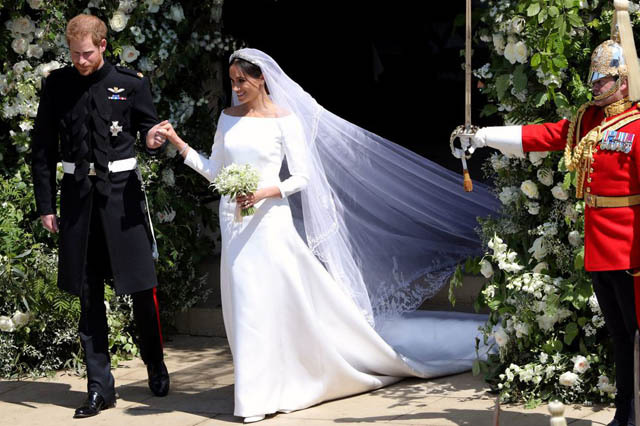 Meghan Markle holding her bouquet which was made with handpicked flowers from Prince Harry. 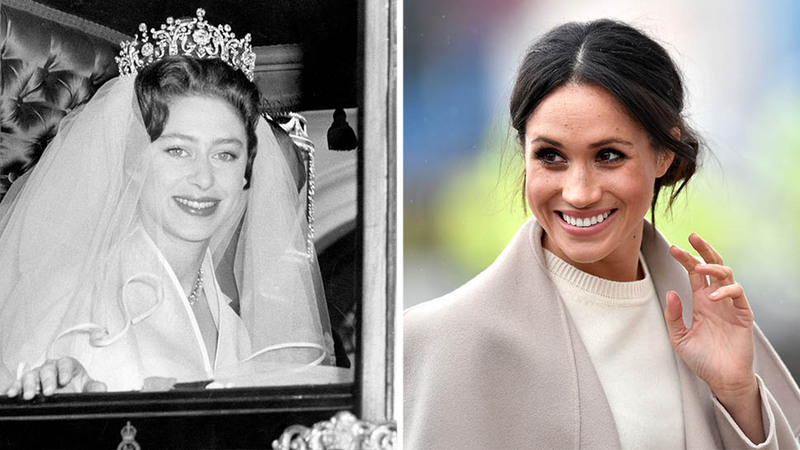 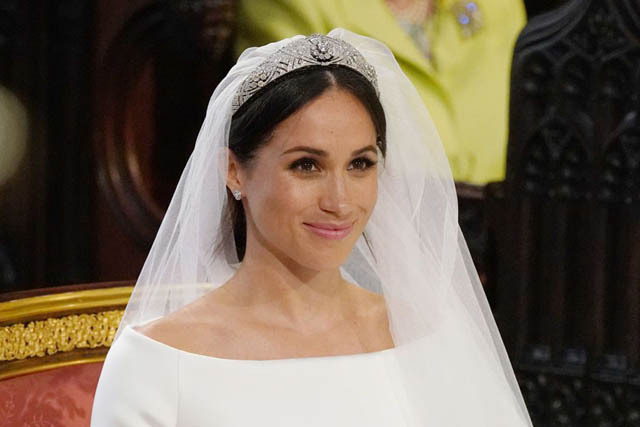 Meghan Markle wearing Queen Mary's sapphire bandeau tiara. 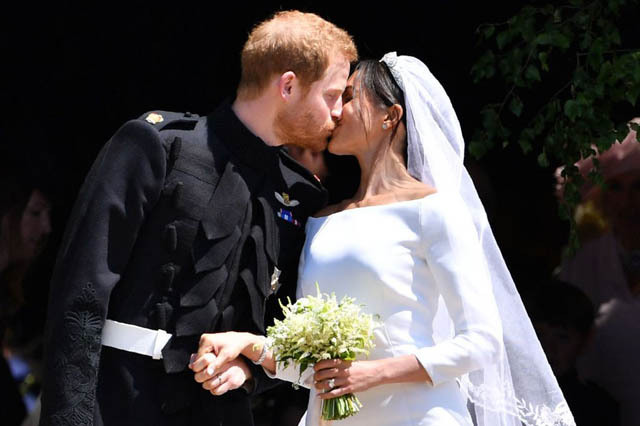 The couple shares a romantic kiss. 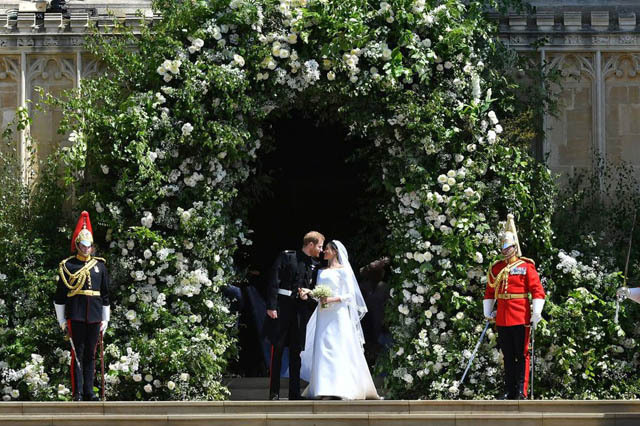 The bride and groom standing in front of a lush flower arrangement. 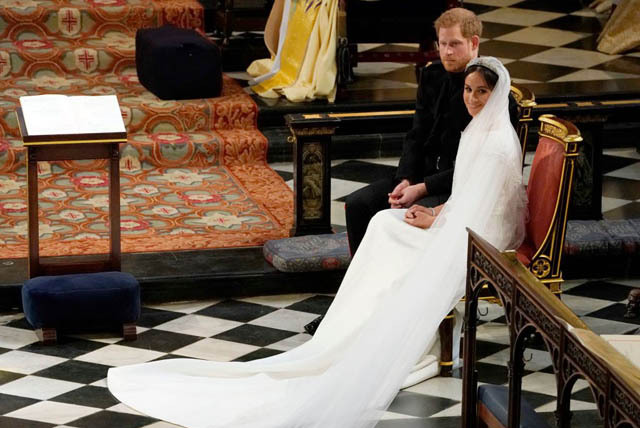 A good look at the bride's dress and long veil. 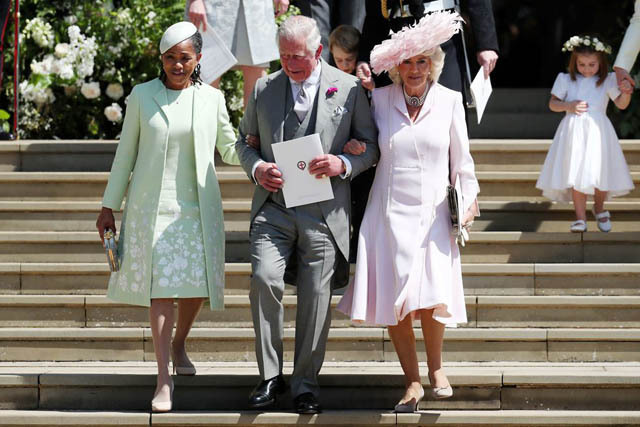 Doria Ragland, Prince Charles, and Camilla Parker Bowles walk down the steps at Windsor Castle. 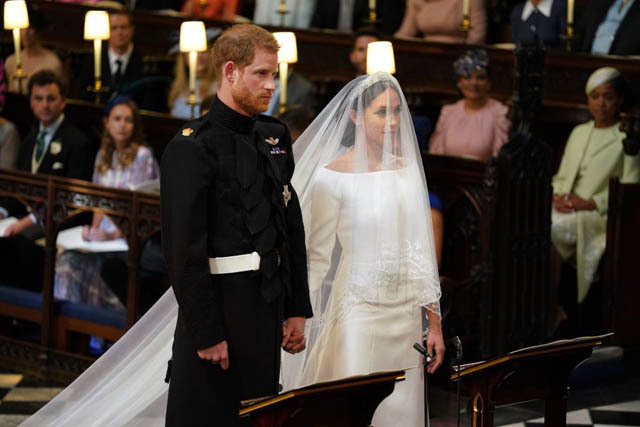 The two share a special moment before walking out of the chapel. 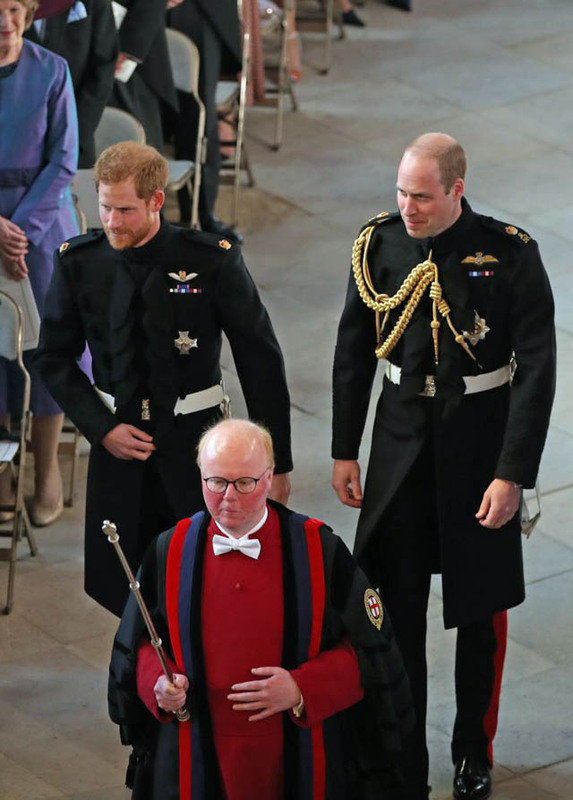 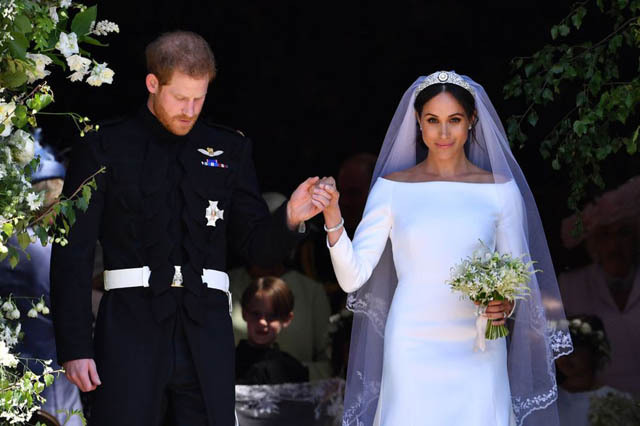 Prince Harry and Meghan Markle leaving the chapel. 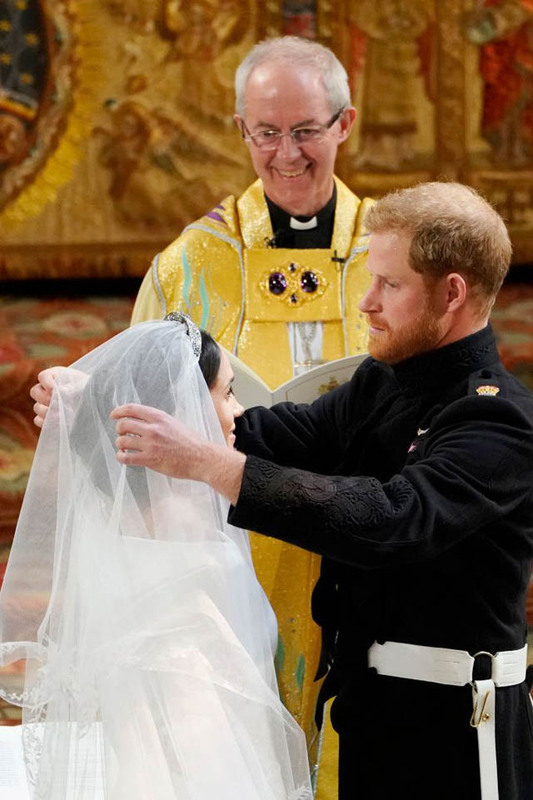 Prince Harry unveils his bride. 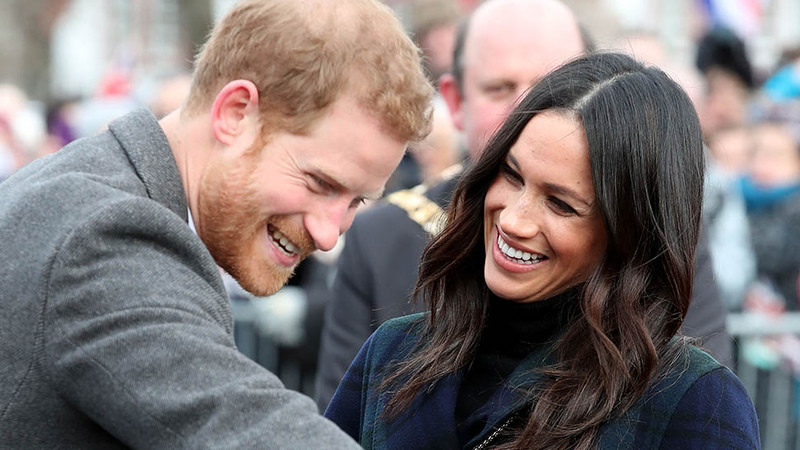 Prince Harry and Meghan Markle look so lovely together. 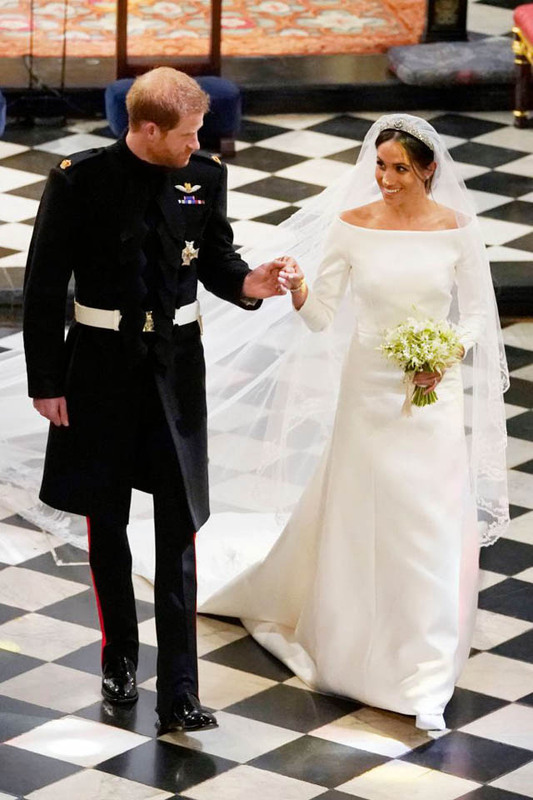 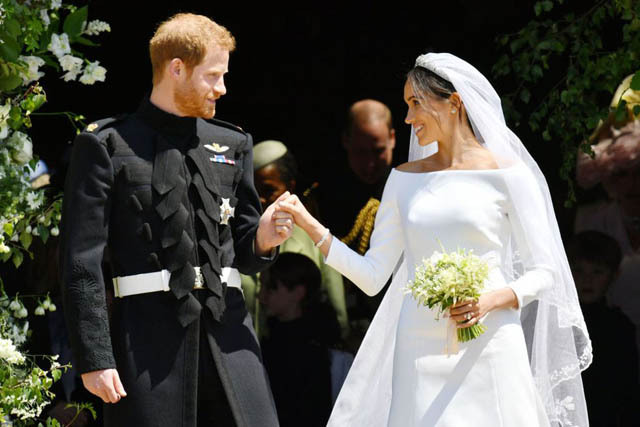 Meghan Markle's gown was designed by the acclaimed British designer, Clare Waight Keller. 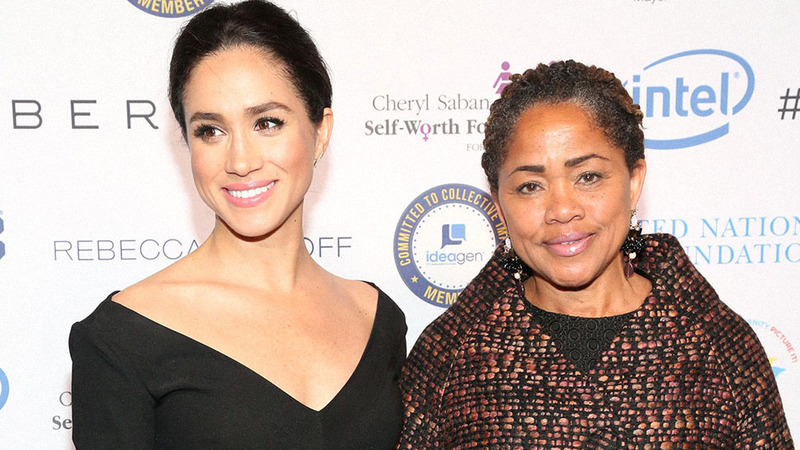 Meghan Markle and her mother. 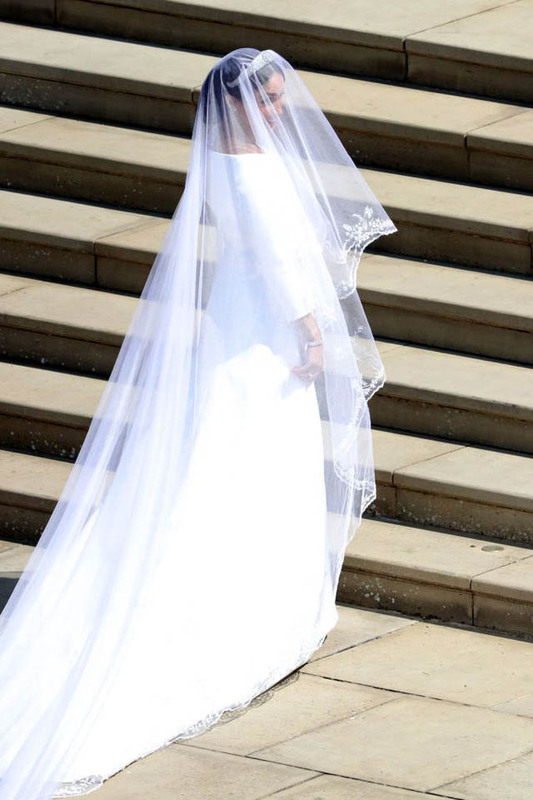 The first look at the bride! 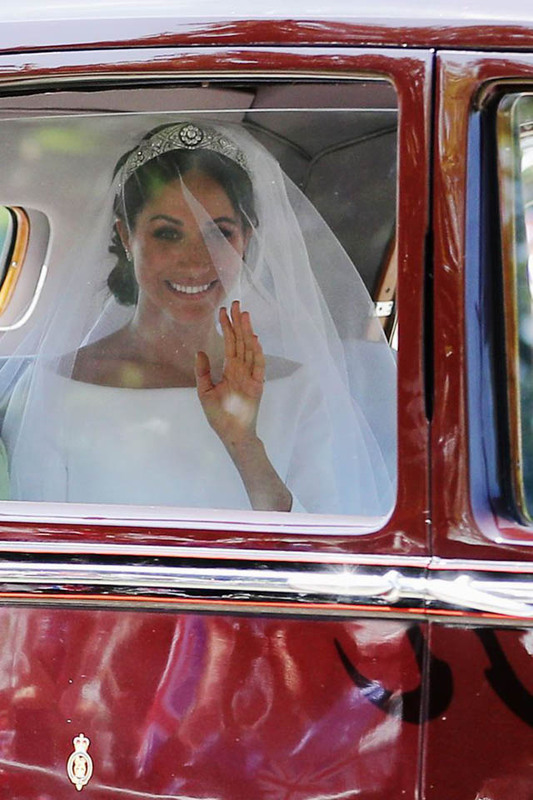 Meghan Markle's car pulling up to the chapel. 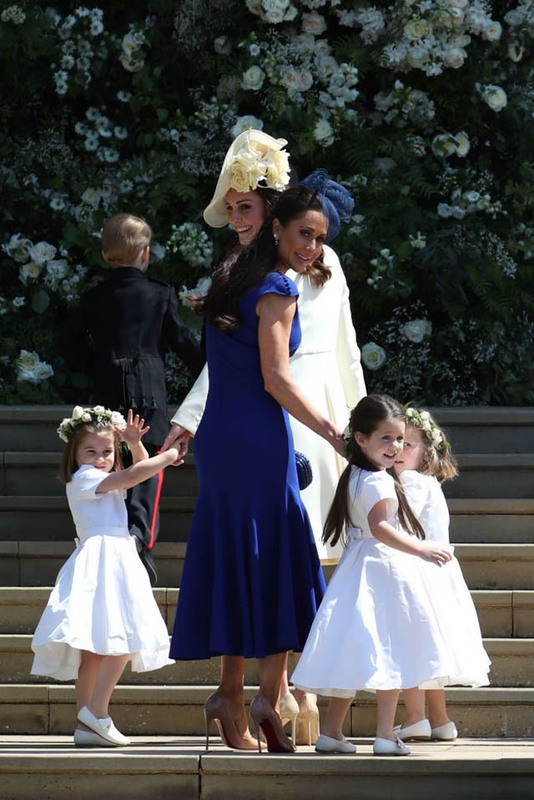 Kate Middleton and Jessica Mulroney hold the bridesmaids hands. 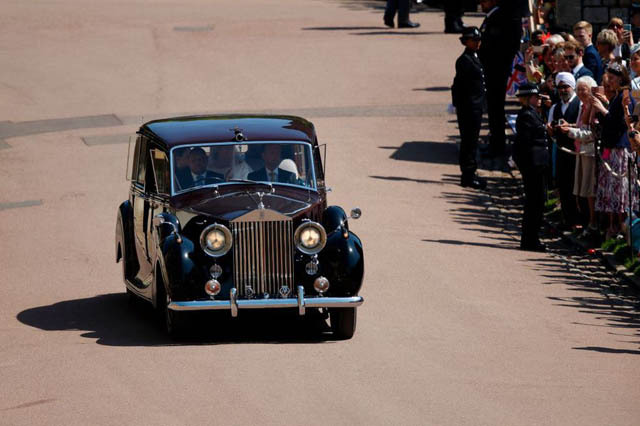 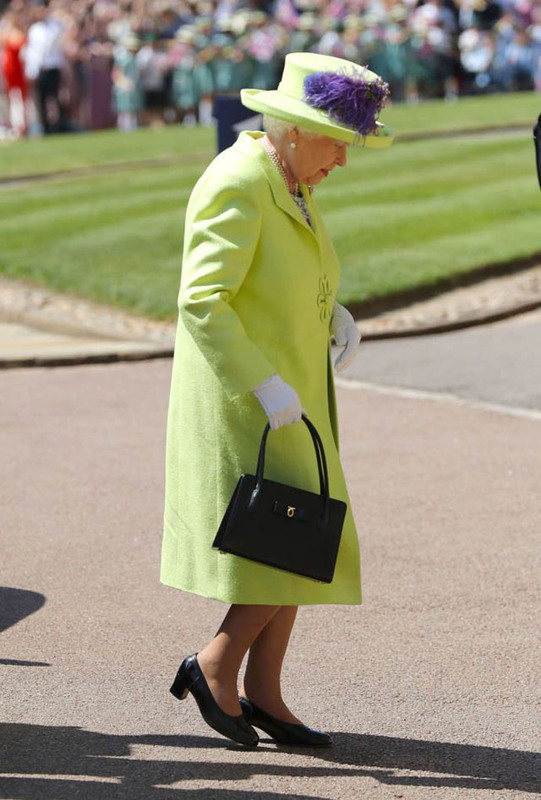 The Queen arriving at the chapel. 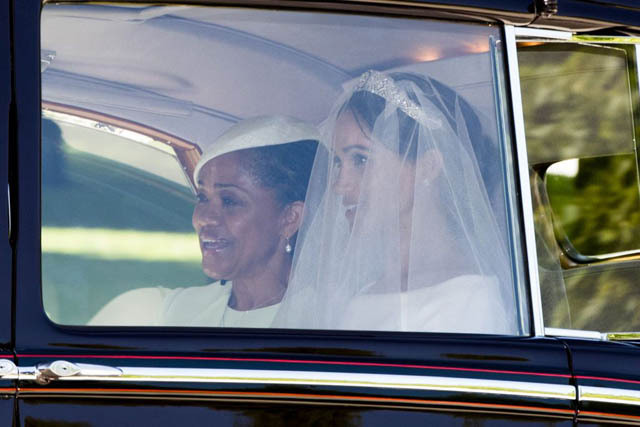 Doria Ragland arrives for the wedding ceremony. 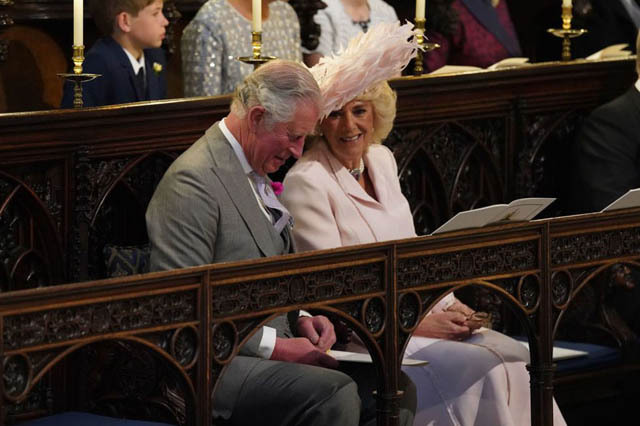 Prince Charles, Prince of Wales and Camilla, Duchess of Cornwall attend the wedding of Prince Harry and Meghan Markle. 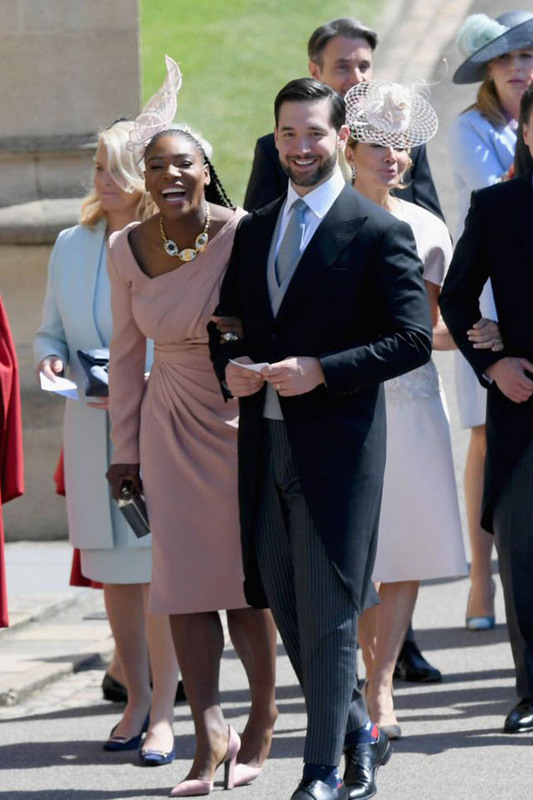 Serena Williams and her husband Alexis Ohanian at the special event. 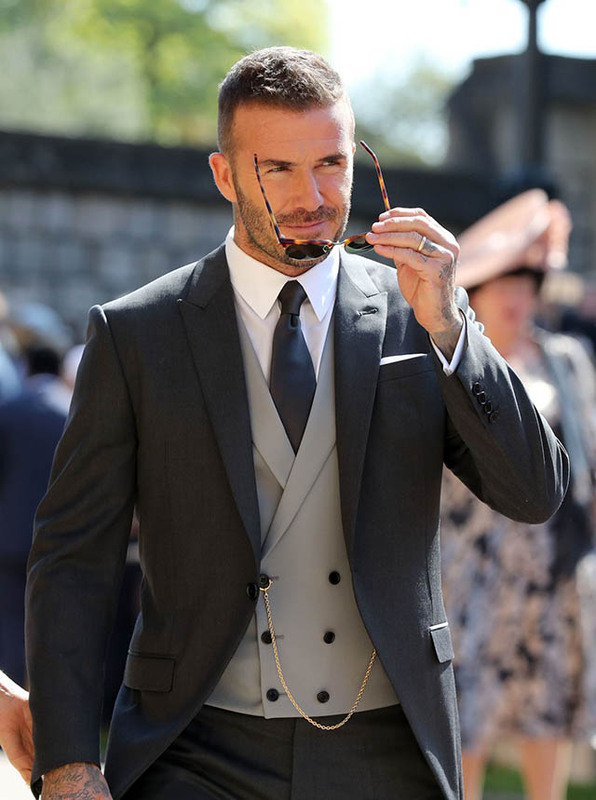 David Beckham looking dapper at the royal wedding. 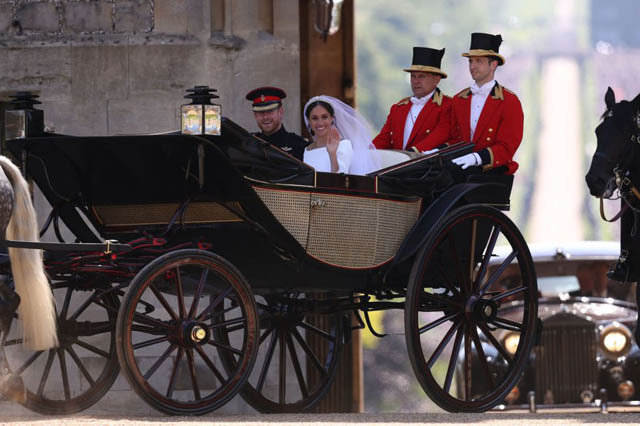 Pippa Middleton and James Matthews arrive. 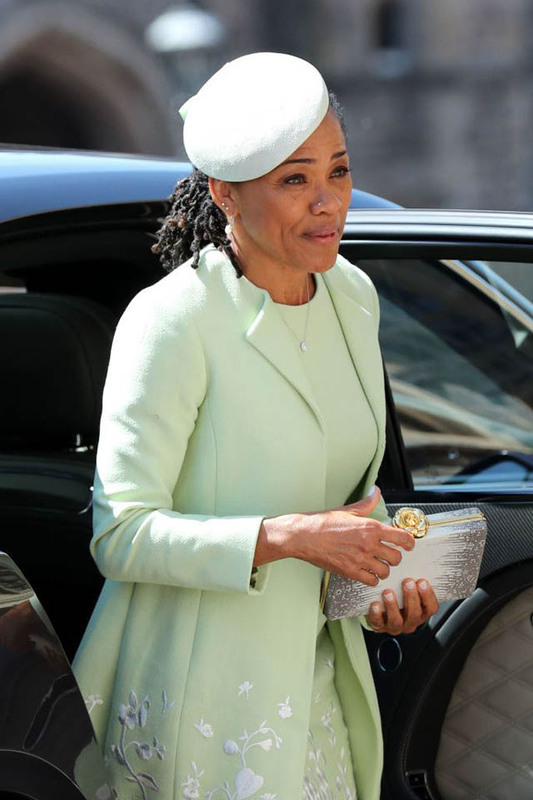 Oprah Winfrey arrives at the royal wedding. 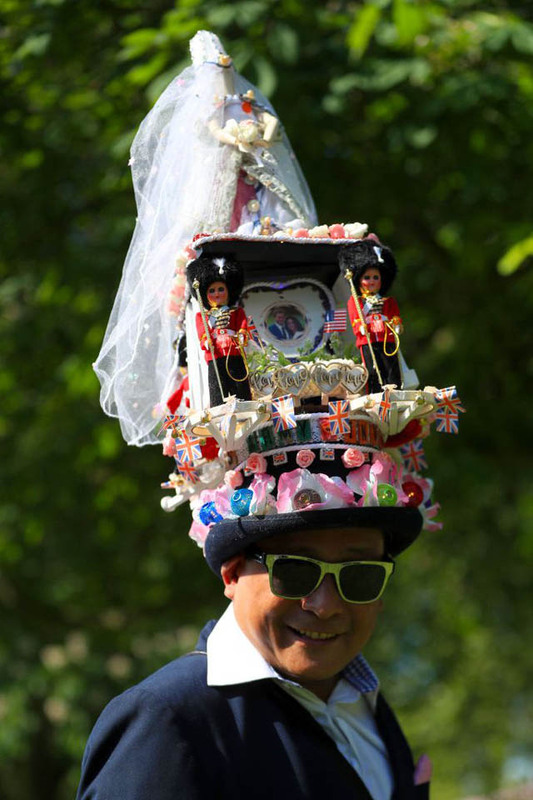 A fan wears a rather wild hat to the royal wedding. 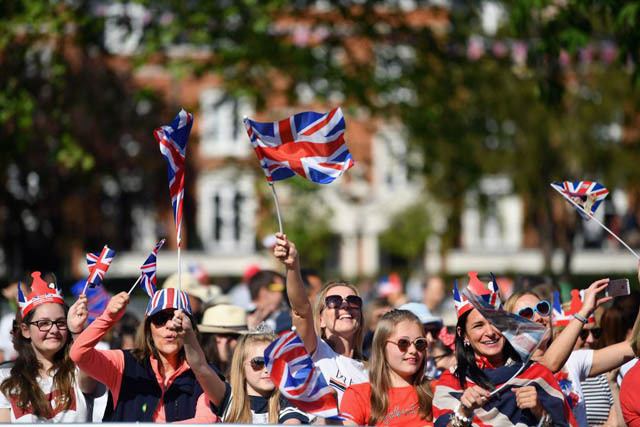 Fans cheering with excitement for the royal wedding. 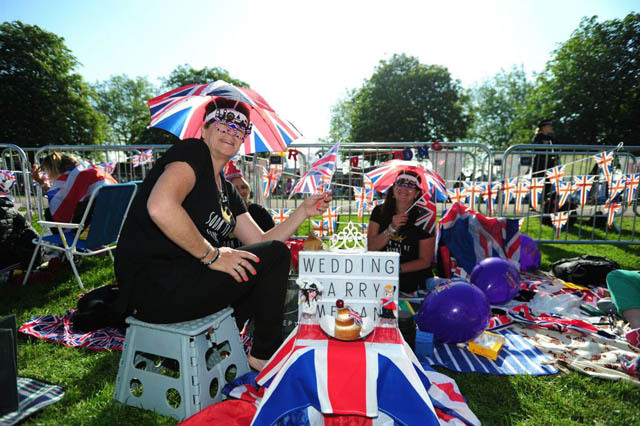 Royal fans festively dressed for the special occasion. 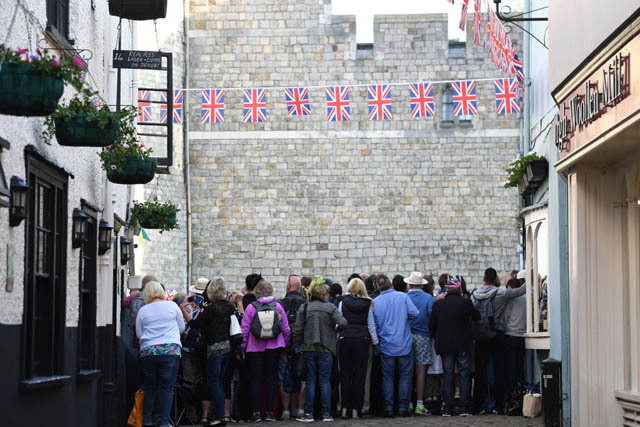 An eager crowd gathers to celebrate the royal wedding. 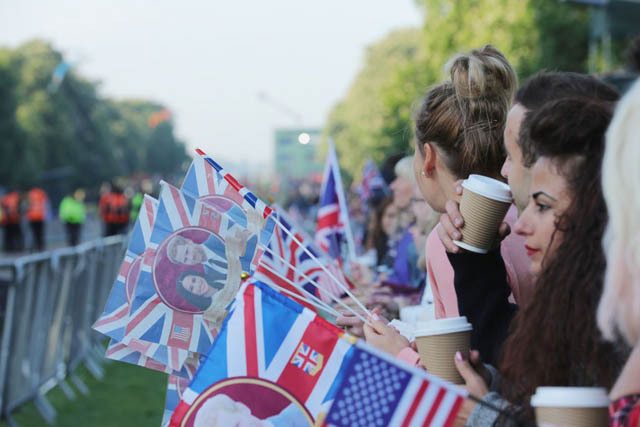 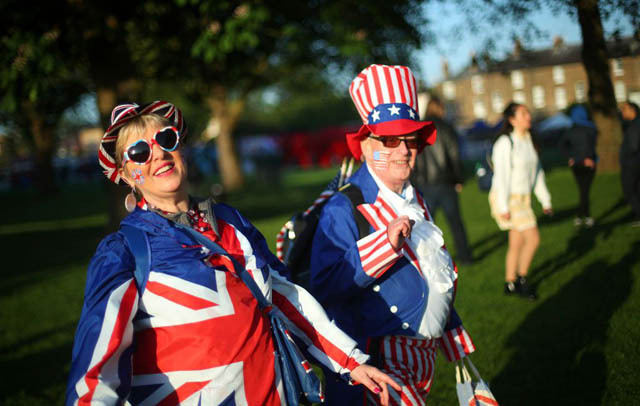 Royal enthusiasts patiently waiting to see Prince Harry and Meghan Markle’s wedding. 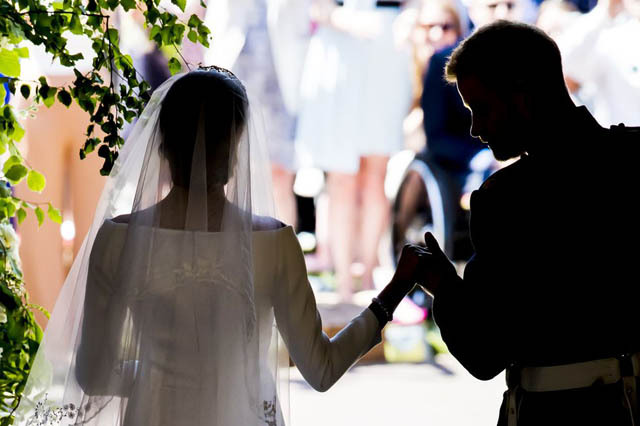 An estimated one million people gathered in London to try to watch Prince William and Kate Middleton’s wedding seven years ago. 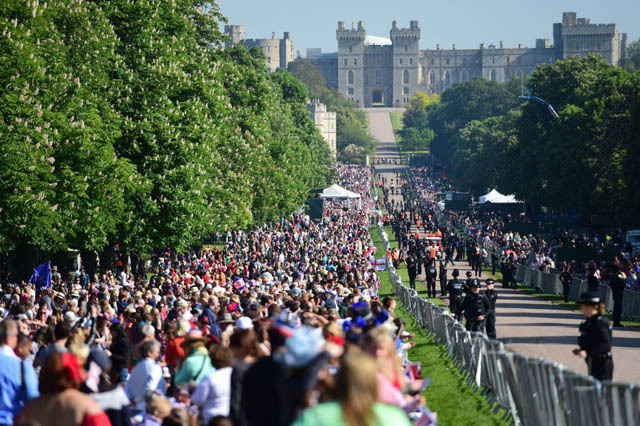 Royal fans line the Long Walk in Windsor ahead of the wedding of Prince Harry and Meghan Markle. 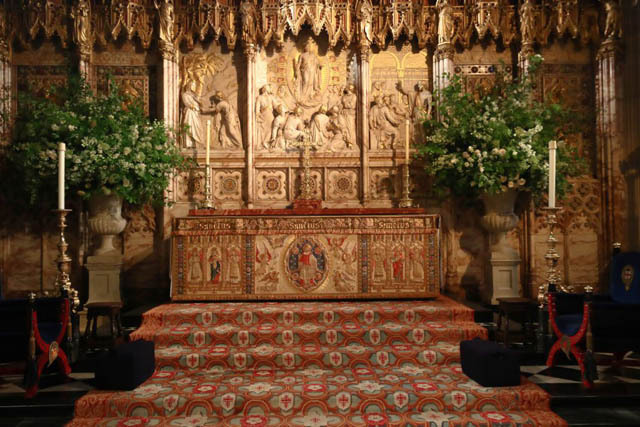 Flowers and foliage adorn the High Altar of St George's Chapel at Windsor Castle. 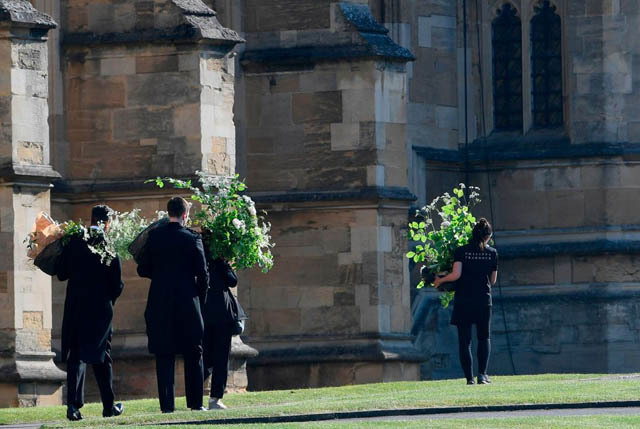 A bundle of greenery embellished on the front of the organ loft inside St George's Chapel. 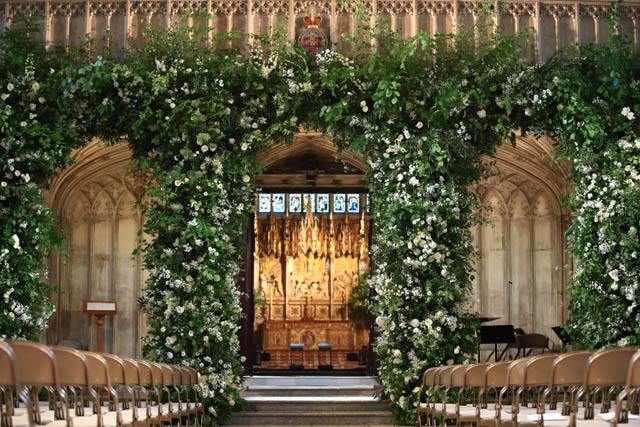 St George's Chapel decorated with flowers the morning of the royal wedding. 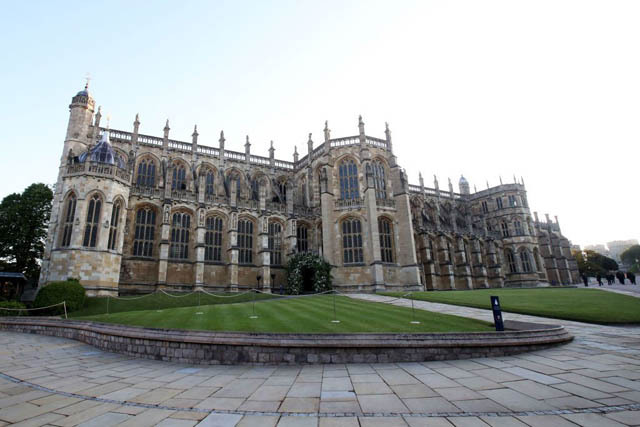 A man sweeps the path outside St George's Chapel in Windsor Castle ahead of the big day. 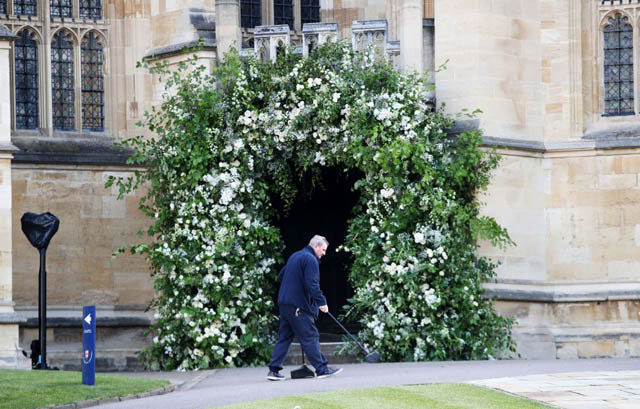 Flowers arrive at St George's Chapel in Windsor Castle ahead of the wedding. 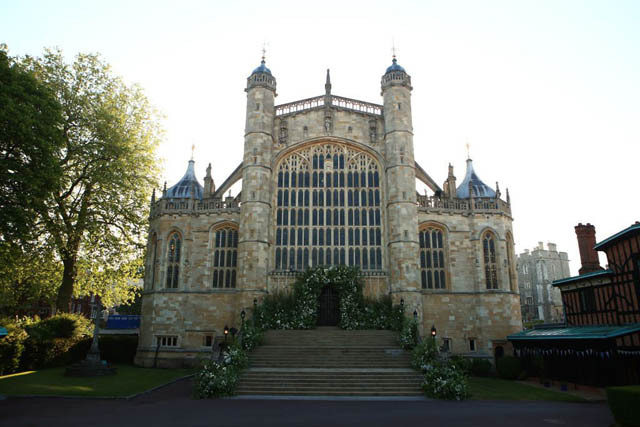 A general view of St George's Chapel on the morning of the wedding.